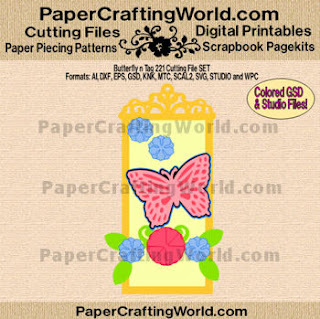 I used the butterfly n’ tag cutting file set from PaperCraftingWorld.com. Here’s a close up of the butterfly. It started as a plain white cardstock cut. I then added some Close To My Heart inks and Pearl Paint to give it that gorgeous shimmer. Here’s a close up of the flowers and bow. I colored the charm with a Copic Marker (E39) and used some Dew drops for the center of the pink flower and around the tag. For my ribbon I used some organza ribbon for the bow. I also used some white acetate ribbon towards the top of this photo. I cut it into very thin strips and then curled it with my scissors. I then attached them so the would stay curled. I didn’t take a picture, but the butterfly began as plain white cardstock cuts. For the butterfly base layer I sponged some ink using my Crème Brulee Ink Pad on the inside and then my Blush Ink Pad on the outside. I set that aside. 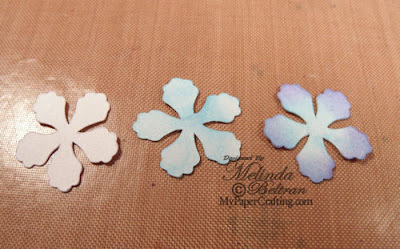 Next I took my top layer cut and sponged ink using the following: Gypsy Ink Pad for the inside, Sky Ink Pad for the middle and then my Sweet Leaf Ink Pad for the outer edge. Next, I added some of the fantastic CTMH Create a Shade Pearl Paint. In this photo you can see where I added the paint to the right side of the butterfly. I wanted to try and capture the difference in the piece that paint adds. After I painted the top layer of the butterfly completely, I adhered it to the base. Here’s a close up of the butterfly once again. I cut my pieces out of plain white cardstock. 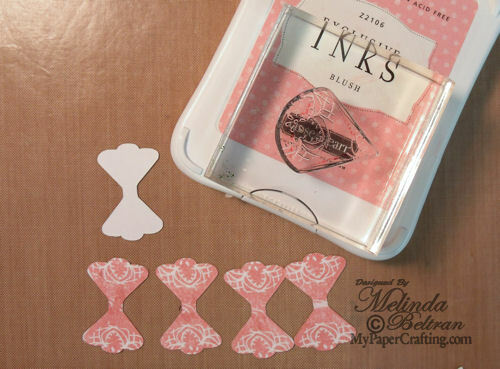 I then stamped the petals with my Blush Ink and the Just For You CTMH Stamp set. I then staggered the petals together and assembled the flower. Here you can see that I curled the petals to give the flower some dimension. Once again, I cut all my pieces out of plain white cardstock. I then inked them with my Sky Ink Pad first and then with My Gypsy Ink Pad. This shot shows the progression. 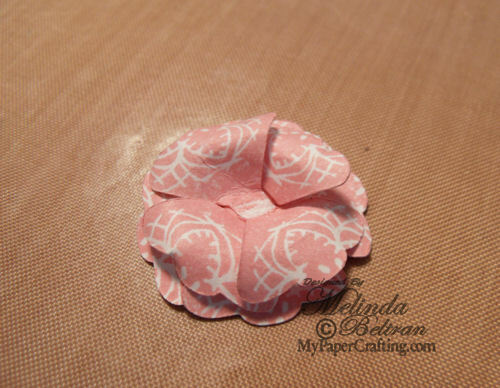 I then staggered and layered three petals and then curled the edges for dimension. It is only $1.00 for the next week! Hope you enjoyed the information and are inspired to create your own tag and or atc! Be sure to visit our Totally Tags Post to see what the other designers created and to pick up your free graphic!!!! Thank you so much for allowing me to share in your crafty time! This is really stunning! The works you come up with are so beautiful! WOW! This is simply stunning -- so many details. I love the technique you used on the butterfly and flowers. I really am going to have to pull my stamps out and start playing with them again! Great job, my friend! thank you for the wonderful details on how to create this masterpiece. It is gorgeous, Melin. Oh you are so talented girl! I just love what you did with the butterfly! So gorgeous! This is so gorgeous Melin. The layering of all the colors on the butterfly is just stunning. Love the shimmer. I also love that cute flower. Thanks so much for such a beautiful tag. Stunning tag! Love how you used the Just for You stamp set to stamp the leaves and flowers and I love how well the shimmer shows up on our butterfly. :) thanks for playing along with us at Heart 2 Heart! This is so beautiful! I love how you used your inks to create the effects you wanted. Thank you for showing us how you did it. Congratulations on making the February Top 10 on H2H! Just lovely! Congrats on making the Top 10 at H2H! Look forward to more of your beautiful creations! Your subtle colors are gorgeous! Congratulations on being in the Top 10 at Heart2Heart Challenges!